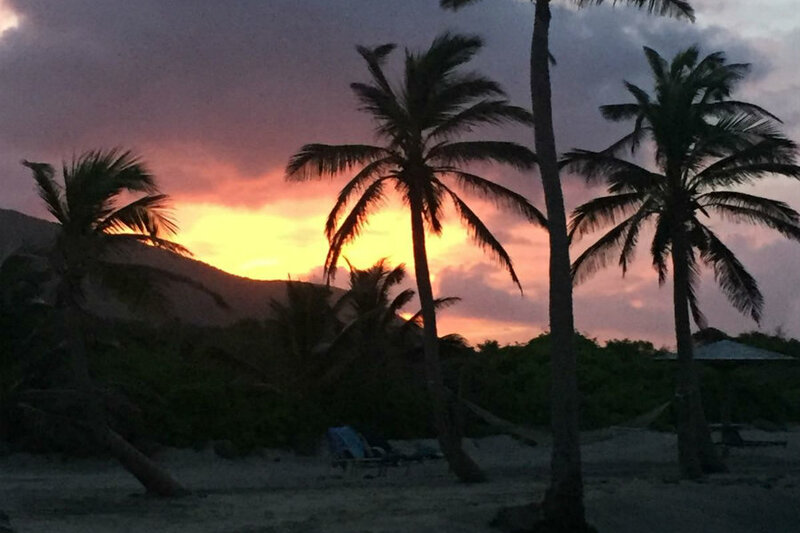 Jo recently enjoyed a few days in Nevis courtesy of the island’s tourist board. This was a trip filled with historical places of interest, stunning natural surroundings, fresh seafood, plenty of rum punch and fun facts about the island. It was a perfect showcase for the small island, where visitors are encouraged to venture outside of their hotel to see the sights and discover the many excellent restaurants and bars. Wherever you are on Nevis, nothing is more than about 20 minutes away, making it quick and convenient to get out and about! 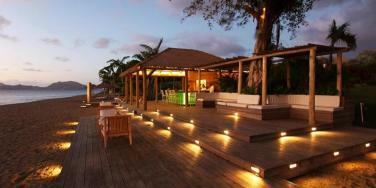 Call Jo on 01752 880 880 to hear more about her trip or to discuss your holiday to Nevis. We left London Gatwick in the morning on a British Airways flight to St Kitts with a very brief stop in Antigua, arriving in the Caribbean mid-afternoon. We were met by a representative from our first hotel, Nisbet Plantation Beach Club, and drove about 20 minutes south through the island to Christophe Harbour. Here, we boarded a private water taxi for the 15 minute crossing to Oualie Beach on Nevis, sipping on a rum punch while taking in the stunning views of Nevis Peak as we approached the island. From here, we drove 5 minutes across the north coast of Nevis to Nisbet Plantation Beach Club where we were staying for 2 nights. I was staying in a Lower Deluxe Junior Suite, a spacious room occupying the ground floor of a two-storey building near the beach. I could catch glimpses of the sea from my patio, hidden behind tropical vegetation facing the Avenue of Palms, with the beach just a short walk away across the grass. That evening we enjoyed a delicious dinner at the Great House, hosted by the hotel’s General Manager. The historic building dates back to 1778 and is an elegant setting providing the option to dine in the air-conditioned restaurant or al fresco on the verandah. The next morning we ate breakfast at the beachside Coconuts Restaurant before setting off on a tour of the hotel. The property is the Caribbean’s only historic plantation inn on a beach, and was once the home of Fanny Nisbet who married Lord Horatio Nelson. With only 36 rooms dotted around lush lawns which lead down to a breezy stretch of beach, Nisbet Plantation maintains a peaceful and elegant feel. The seafront swimming pool is in a beautiful location, while it is also possible to swim in a small area of sea which is protected by a rocky groyne that pelicans use as diving platforms. There is accommodation to suit different requirements, with the Upper Premier Junior Suites providing the best views from their first floor setting near the beach. The Deluxe Garden Suites are best for families as they boast a separate enclosed porch area where a sofa bed is found, with shutters opening from the main room to allow the air-conditioning to flow through. After this we drove about 20 minutes across the island to The Hermitage, a small boutique hotel located in the southern foothills of Nevis Peak. The property is well worth visiting for a traditional Nevisian lunch, served on the verandah of the Great House which is the oldest wooden house in the Caribbean. From here it was just a few minutes’ drive to Montpelier Plantation & Beach, where we just had a short tour as we were returning later in the week for dinner. Surrounded by 60 acres of lush tropical gardens, rooms at the hotel are contemporary and minimalist with luxurious touches such as Elemis products in the bathrooms. The beautiful pool area is at the centre of the Relais and Chateau property, with another highlight being the Sugar Mill where guests can choose to dine for an extra special experience. Next we set off on an enjoyable Funky Monkey island tour, which took us off the beaten track in a 4×4. 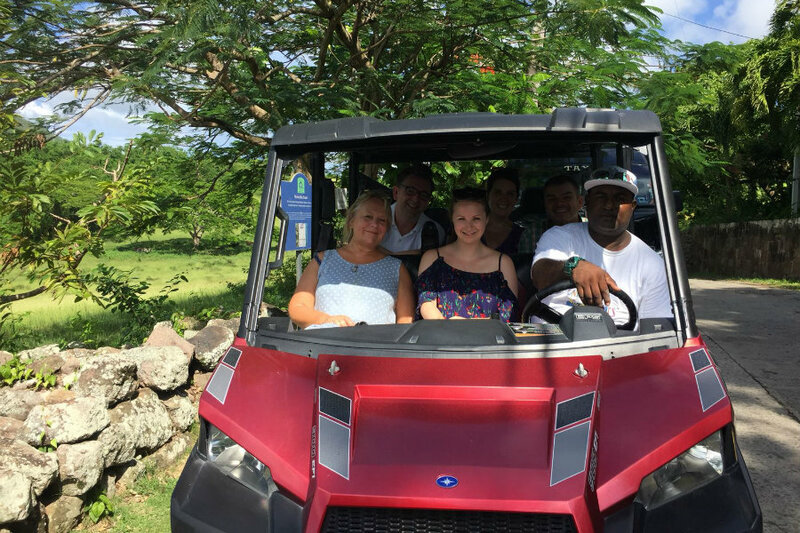 This was a great opportunity to see another side to the island as we drove along dirt tracks, with a knowledgeable guide pointing out wildlife and places of interest including beaches and plantation ruins. We also passed the ruins of the Cottle Church which is known for being the first on the island to allow whites and black slaves to worship side by side. After this it was time to return to Nisbet Plantation to change before heading to The Yachtsman Grill for dinner, located about 10 minutes away on the west coast of the island. The beachfront restaurant offers a stunning setting in which to dine, serving fine wines and superb cuisine including mouth-watering lobster dishes and wood-fired pizzas. We checked out of Nisbet Plantation early and headed to Paradise Beach Club, where we enjoyed a freshly prepared breakfast in one of the resort’s luxurious private villas. 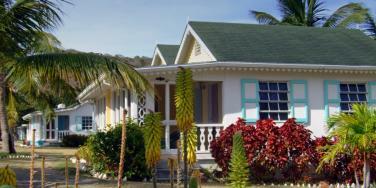 There are currently just seven secluded villas which guarantee great attention to detail throughout. New rooms are being built on stilts along the beach, each with a plunge pool and an entrance ladder that can be raised for added privacy. After breakfast we drove further north to Oualie Beach Resort, an eco-friendly property offering good value for money where guests can snorkel straight from the beach. A short drive took us to Pinney’s Beach, where we visited the extremely popular Sunshine’s Beach Bar for lunch. Sunshine’s is best known for its famed Killer Bee cocktail, but also serves a great selection of locally caught and freshly grilled seafood. We then boarded a catamaran for a three-hour cruise and snorkelling trip, crossing ‘the Narrows’ towards neighbouring St Kitts. 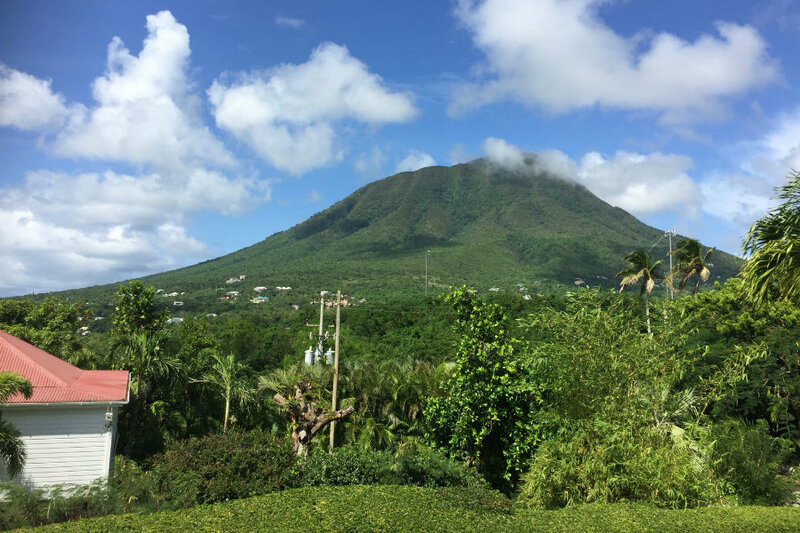 It was a fantastic experience to see Nevis from the water and afforded us spectacular views of Nevis Peak as well as the golden beaches that fringe the island, while also showing just how close St Kitts is. We disembarked the catamaran at the Four Seasons Resort Nevis where we checked in for two nights, located near Sunshine’s on Pinney’s Beach. We were staying one of the vast resort’s luxurious villas which boasted a large private pool and included a golf buggy to get around. 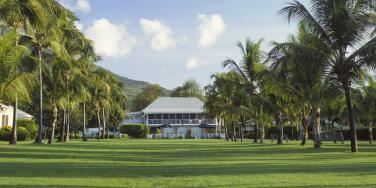 Our villa was located in the Palm Grove area which was relatively close to the heart of the resort, while others surround the landscaped golf course which stretches up the hillside of Nevis Peak. 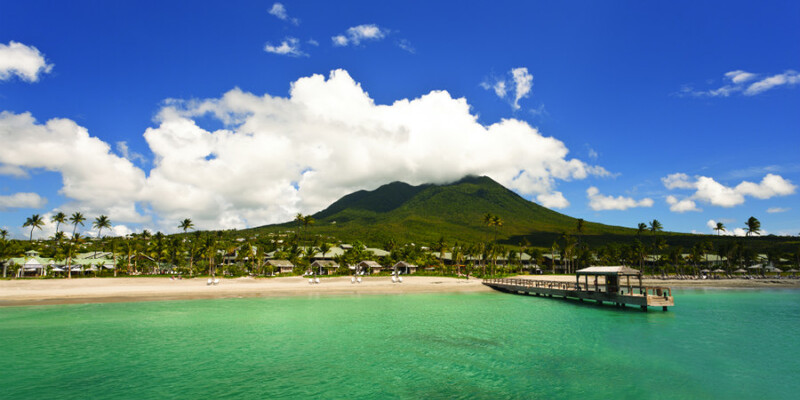 The resort offers the high standards of service and facilities that you would expect from a Four Seasons property, including plenty of bars and restaurants and a private boat service to St Kitts. Beach cabanas can be hired by the day, perfect for those staying in a villa which is far away from the main resort. Dinner that evening was at the waterfront restaurant, Mango, where Caribbean dishes were served al fresco with panoramic views towards St Kitts. We ate breakfast at the resort’s Neve restaurant, then set off on a tour of the huge resort. We then headed to Golden Rock Inn, a boutique hotel set within 100 acres stretching up Nevis Peak in the east of the island. There are eleven unique guestrooms set within the beautiful gardens, simply furnished with splashes of colour and thoughtful touches offering a special feel. The restaurant terrace is a wonderful spot for lunch, serving legendary lobster sandwiches in the open air or under a stone gazebo overlooking cascading pools. From Golden Rock it is a 10 minute drive to the Nevis Botanical Gardens, where five acres of gardens are home to one of the finest collections of tropical plants in the Caribbean including stunning orchids. 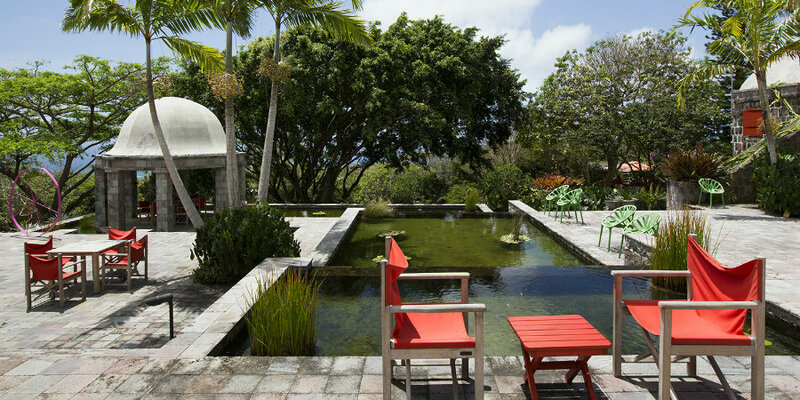 I would highly recommend spending a few hours strolling along the winding paths, with a pretty Great House situated at the centre of the garden where visitors can relax with a drink and take in the views of Nevis Peak. After leaving the botanical gardens, we drove across the island to The Gin Trap on the north-west coast, stopping at an old church along the way to watch the sun go down. The bar and restaurant is a contemporary venue offering a vast selection of cocktails and other drinks as well as a food menu that makes the most of fresh produce. If you can’t decide which of the 101 gins to sample, why not allow luck to guide you by spinning the wheel of ‘Gindecision’! It was then a quick trip back to the Four Seasons to change before returning to Montpelier Plantation for dinner, where we enjoyed lots of delicious food and superb wine. Having already visited the hotel in the daytime, it was interesting to see it transform into a magical setting at night! Our last morning in the Caribbean was spent at leisure, with plenty of time to wander around the Four Seasons and enjoy the resort’s facilities. We ended our time on Nevis by travelling to Oualie Beach for the boat transfer back to St Kitts, where we boarded our flight back to the UK. 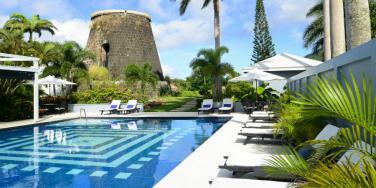 Call Jo on 01752 880 880 to hear more about her trip to Nevis and the hotels she visited.